Milk chocolate with dried grapes (13%) and almonds (7%). 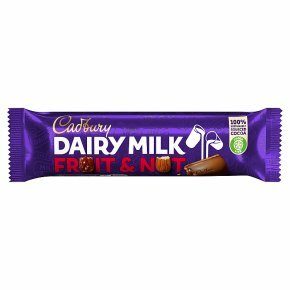 Cadbury's deliciously creamy milk chocolate with dried grapes and chunky almonds. Made with a Glass and a Half of fresh milk. Individual 49g chocolate bar - perfect for an afternoon treat. Suitable for vegetarians.